Yesterday I finally made a trade-in / trade-up. Still not part of the "smart phone" world... trust me, my cell phone is dumb, dumb, dumb, but I'm okay with that. That is what my old iPod looked like, just a few more scrapes and smudges. 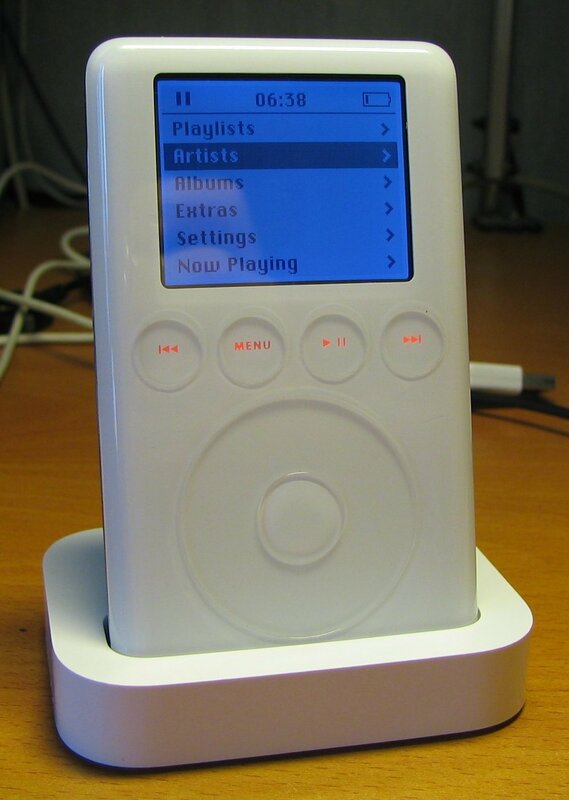 I had thought it was a first or second generation, but as I was looking for a photo online I learned that I had a THIRD generation iPod, released back in 2003. Yep, I had an Apple product working for me for 10 years! Until the battery just went kaput. Well, not entirely, only when it had been unplugged from a power source for about 1 1/2 - 2 hours. Even while turned off. No juice. So on an errand-running mission yesterday J and I were passing by The MAC Store (not the makeup one) by the Lloyd Center and I asked if he minded swinging in there. I go straight for the iPod display and though I am briefly tempted by the iPod Touch, I knew that my goal was to get an iPod Nano. I just don't have that much music stored up and only use the thing for doing yard work, bike rides or the occasional trip to the gym. And let me tell you, they are NANO! I mean tiny! Just trying to test it out and put in the headphones it kept slipping from my hands. I knew right then it would need a little cozy sooner rather than later to keep it safe (and visible). On days that I work at the quilt shop I like to have some hand sewing, knitting or crochet with me to stay busy during quiet times. As I was gathering things to bring with me this morning I went looking for scraps of batting and whatever fabric I had at home to play around with a prototype for the nano-cozy. I came across a deserted QAYG (quilt as you go) block that I did a couple of years ago, but didn't like much so it never became anything. ...as my first ever iPod nano accessory. At this point I think it's only missing some velcro and a strap to go through the "belt" loop that can be adjusted as either an arm band or to fasten to a backpack strap or something.... Just don't look too closely at the terrible hand stitching! Not a skill I'm practiced at.